Ten Speed Press, 9781607740353, 128pp. From the pure, radiant flavors of classic Blackberry and Spicy Pineapple to unexpectedly enchanting combinations such as Sour Cream, Cherry and Tequila, or Strawberry-Horchata, Paletas is an engaging and delicious guide to Mexico’s traditional—and some not-so-traditional—frozen treats. 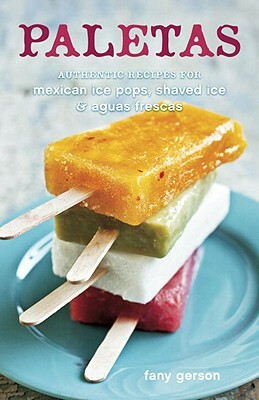 Collected and developed by celebrated pastry chef Fany Gerson, this sweet little cookbook showcases her favorite recipes for paletas, those flavor-packed ice pops made from an enormous variety of fruits, nuts, flowers, and even spices; plus shaved ice (raspados) and aguas frescas—the delightful Mexican drinks featuring whole fruit and exotic ingredients like tamarind and hibiscus flowers. Whether you’re drawn to a simple burst of fresh fruit—as in the Coconut, Watermelon, or Cantaloupe pops—or prefer adventurous flavors like Mezcal-Orange, Mexican Chocolate, Hibiscus-Raspberry, or Lime Pie, Paletas is an inviting, refreshing guide guaranteed to help you beat the heat. As the country’s most authoritative voice on Mexican sweets, FANY GERSON has been featured in the New York Times, Gourmet, Fine Cooking, Daily Candy, Village Voice, NY Daily News, Time Out magazine, and New York magazine, among other publications. She recently launched the acclaimed La Newyorkina, a Mexican frozen treats and sweets business that began with her love for paletas. A graduate of the Culinary Institute of America, Fany has worked in a range of fine-dining kitchens around the world. Visit www.lanewyorkina.com for more information.